"How many dendrites does this guy have?" Merl Reagle is referring to crossword solving whiz, Dan Feyer, just minutes before he wins the most prestigious title in the world of American crosswords — the American Crossword Puzzle Tournament, or ACPT for short. If you're familiar with this wonderful competition, you will know that in recent years the event has been dominated by the incredibly young and talented crossword solver, Tyler Hinman, who has stubbornly held on to the trophy for five consecutive years! Now I've read and written quite a bit about some of America's veteran crossword solvers, like Tyler Hinman and Trip Payne, but I had never heard of this guy. And for good reason. You see, Dan Feyer is a relative newcomer to the world of crossword solving, stealing its most coveted trophy after less than three years of competition! So Dan, tell us about the guy in the picture. I was born and raised in San Francisco, studied music and theater at Princeton, and moved to New York City to work in musical theater. 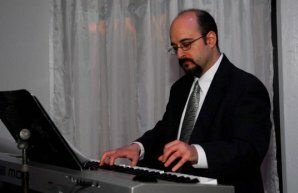 I play the piano for shows, auditions, and classes, and do associated jobs like conducting, arranging, and orchestrating. I don’t have any particularly interesting hobbies — when I’m not working or doing crosswords, I’m watching TV, surfing the internet (do we still call it “surfing”?) and hanging out with my girlfriend. Do friends and family generally encourage or ridicule your devotion to crossword solving? I've found that talking about a crossword hobby can be quite a conversation-killer, so many of my friends didn't know how devoted I was until I won the tournament and bragged about it on Facebook. Since then, of course, everybody has been totally supportive. My parents have started crossword solving regularly, and together they can usually finish the Thursday and Sunday New York Times puzzles. When I saw your name in first place this year, I assumed you came out of nowhere. But in my interview with Trip Payne, he said that he and others had you pegged from the start. Did you sense that you were a favorite? And what made you a favorite going into the event? Apparently I’d been giving the impression that I was gunning for the championship and would not be denied. I do post my solving times on my blog every day, but that’s for posterity, not intimidation! I always have low expectations, so it was still a little surprising that I went wire-to-wire in first place. In the 2009 ACPT I believe something went wrong in Puzzle 7 that prevented you from making the final. Can you tell us what happened? I was just a little too slow. My two excuses are that I was tired (Puzzle 7 begins at 9 AM, and I'm not a morning person) and that I didn't have a firm enough grasp on the tie-breaker rules. I had a one-minute lead on Trip Payne and Francis Heaney, and a two-minute lead on Tyler Hinman, and I didn't realize that if we all ended up tied, I would be in fourth place because of my performance on the most recent puzzle. Thanks to Tyler's clutch under-8-minute solve, that's exactly what happened. I had intended to be extra-careful when solving, but I took that a bit too far and missed a spot in the finals by 10 seconds or so. I've read that you solve 20 to 30 puzzles a day as a matter of course, but is there any special preparation you do to hone the brain and fingers in the lead up to the ACPT? Do you switch from online to pen and paper, for example? That's exactly it — since I do most of my crossword solving on the computer, it's important to get in the groove of speed-solving on paper. Other strategies, which I didn't employ this year but have in the past, include speed-solving 17x17 and 19x19 puzzles (since those sizes are in the ACPT, but don’t run in newspapers) and dipping into collections by Maura Jacobson and Merl Reagle (since they're sure to have puzzles in the tournament). What's it like solving a crossword up there on stage with an enormous grid and big fat marker pen in your hand? Was it hard to adapt? I mean, it's not like you can practice that one at home, right? Or ... um ... do you? No, I've never practiced on a giant grid (like sudoku champ Thomas Snyder), but the thought has crossed my mind. Now that I've had four whiteboard experiences (Lollapuzzoola 2 and three ACPTs), I'm not fazed anymore, but it was definitely strange the first time. The headphones and white noise were easy to ignore once I started solving — the biggest difference to me is perspective. You have to lean back a bit to see a whole section of the grid, and it's useful to keep an eye on the big picture as well as on individual crossword clues. How do you decide when to sacrifice time for an accuracy check? The only time I’ve taken an extra minute to scan the completed puzzle was this year's Puzzle 7 — I had a two-minute lead going into that last round, and figured (correctly this time) that I wasn't in danger of getting bumped out of the finals unless I had a letter wrong. Otherwise, I've always handed in my paper when I was done, after spending the remainder of the minute checking for errors and blank squares. I don’t think a top ACPT contender ever sacrifices a whole minute for proofreading, except in a circumstance like I had this year. Do you do most of your crossword solving with pen-and-paper, or do you prefer screen-and-keyboard? I never use a pen — cheap Bic mechanical pencils are my weapon of choice. I like to solve on the computer, because it saves paper, toner, and time. Did you have a very good general knowledge before entering the world of crosswords, or did you pick up most of the required knowledge and trivia through crossword solving? Pretty good general knowledge — not "win on Jeopardy!" good, but probably "qualify for Jeopardy!" good. Sports and pop culture are my strong points, anything academic (history, geography) less so. My knowledge pool is wide but shallow, which is good for crosswords (and, come to think of it, Jeopardy!). I've certainly learned a whole boatload of trivia from crossword solving, at least that which involves three- to five-letter words. Guess I should try out for Jeopardy! sometime. Which crossword puzzles do you solve more or less religiously? and anything that constructors put up on the web for free — I most look forward to site updates from Trip Payne and Patrick Berry. For links to these puzzles, see Will Johnston's Puzzle Pointers. What's your take on crosswordese — do you like it or loathe it? What are a few of your favorite/most hated repeaters? I don’t really have strong feelings on crosswordese... it’s going to be in every grid, and one hopes that it’s minimal. If it’s not, I’m finishing the puzzle in three minutes anyway, and I’ll forget about it and move on to the next one. Crosswordese helps me speed-solve, because I can usually instantly enter any word that I’ve seen dozens (if not hundreds) of times. I guess the ones that bug me are those that are ambiguous, in that you need crossings to know whether it’s INURE or ENURE, EEO or EOE, etc. I kind of hate the ODER and EDER Rivers because I don’t know anything about the actual geography, and can never remember which one is in Germany (apparently, both.) And in sympathy with friends, I’ve developed a revulsion for IRED/IRES and NLER/ALER. I know you, and other crossword solving gurus, say the main key is to practice, but there are plenty of people who do lots of crossword solving without really getting much better. I think there is something a bit uncommon going on in your mind as you solve puzzles that leads to rapid improvement. What do you think? I’d be surprised if anyone who solves crossword puzzles regularly isn’t getting better, just by learning the crosswordese and the cluing conventions, even if they never end up good enough to finish a Saturday puzzle. Crossword solving practice is key, but you also have to know a lot of proper nouns and names. In order to solve a crossword puzzle as fast as possible, some solvers don't take much notice of the theme. Do you find thinking about the theme of a puzzle is a help or a hindrance when speed-solving? It depends on the puzzle. In terms of speed-solving, generally, the harder the puzzle, the more useful it will be to stop and think for a few seconds, or jump around the grid, and try to figure out the theme. I don’t know exactly how I make that decision — it’s just one of those things that advanced solvers learn to sense. When you're solving as many puzzles as you do in a day, and solving them quickly at that, do you actually enjoy the crossword solving process? Do you ever solve a puzzle slowly just to savor it? I’m not speed-solving all the time! On the computer I am — even old puzzles that I’m not posting times for on my blog — because it’s hard to ignore that little Across Lite clock. When solving in a crossword book, I’m not racing, but I don’t find that consciously slowing down makes it more fun for me. The “aha moments” are still there, even if they go by quickly. I do some things to get more out of puzzles, though, like using Down clues only — I solve old Monday and Tuesday New York Sun puzzles that way. With a themeless puzzle, I’ll fill in a corner, stop, and restart in another section, so I have to break into each corner without any crossing letters. Similarly, in a standard cryptic crossword puzzle, I sometimes won’t fill in the letters that cross other words, trying to solve all the clues without benefit of crossings. Do you enjoy cryptic crosswords too? Love ’em. I was already very good at regular crosswords when I started doing cryptics, so my facility with the “definition” part of the clues made the learning curve less steep than it might have been. Like many crossword solvers, I relish the challenge and creativity of tough variety cryptics. Which crossword puzzles (constructors and/or publications) do you find toughest to crack? Hard to say, since at this point I can finish just about any standard crossword without too much trouble. Some Saturday New York Times crosswords by Bob Klahn or Byron Walden have taken me more than ten minutes. I’ve found some of David J. Kahn’s puzzles disproportionately hard for some reason. Many crossword solvers have trouble with Peter Gordon’s harder Fireball crosswords (and before that, the New York Sun puzzles he edited), but I’ve always been on Peter’s clueing wavelength. How often does a crossword clue leave you stumped nowadays? I mean, there must surely be factual questions that you simply don't know, right? Plenty of clues stump me, but the great thing about crosswords is that ... well ... the words cross! The problem is when there are two unknowns crossing, and once in a while, I’ll come across a name I’ve never heard crossing with a foreign word I’ve never seen. This never happens in the NY Times (because Will Shortz is very good at his job), but in less heavily-edited puzzles, like Merl Reagle’s or the Boston Globe, I’ll occasionally have to ask Across Lite for that final letter. When I have to make a guess, I have a good linguistic sense of which letter will make the most likely word or name. Now that you've made it to the top, do you think you'll let your hair down a bit and move on to other things, or has the victory motivated you to practice even harder to stay there? Well, I don’t solve 20 to 30 puzzles a day anymore. Actually, it may still average out to 20, because I’ll go on a binge every so often and solve old crossword puzzles on my computer for an hour. What crossword software do you have installed on your computer? But I pretty much only use that first one. What are your top five websites for crossword solving? XWordInfo may be the best thing to happen to crosswords since Across Lite. I read the major crossword blogs every day: Rex Parker, Crossword Fiend, Wordplay, and Ryan & Brian, and usually keep up with LA Crossword Confidential and An Englishman Solves American Crosswords. And Word-Buff, of course! Sorry, that’s more than five. Has the crossword obsession had a negative impact on your music or other important activities? I hope not! I haven’t turned down any gigs in order to do more crosswords, and I was a world-class procrastinator way before I got into puzzles. Besides crosswords, is there evidence of an obsessive character in any of your other life pursuits? Did you wash your hands incessantly as a child? Many champion crossword solvers are also crossword constructors. Are you interested in joining that fray, or have you already? one for Ryan and Brian's first Lollapuzzoola tournament — you can download that crossword puzzle here, and solve it on your computer with Across Lite. Mega Crossword Puzzle Book #8 . The first came about because I couldn't attend the event and offered to help out (and Ryan and Brian weren't friends with enough real constructors at that time), and the second because I had a theme that perfectly fit a 19x19 grid, and Simon & Schuster is the only outlet that accepts that size. I'd love to have a byline in the NY Times at some point, but I don't have the skills to be a regular constructor. It's analogous to my music career, where I’m good at interpreting and arranging music, but don't have the talent or interest to be a composer. Do you indulge in any other types of word games and puzzles besides crosswords? Not really. My brother can destroy me in Scrabble. Tell us a wonderful crossword clue you've come up against in the last week or so. This interview has been fascinating, thank you Dan. Before you go though, I'm wondering if you could help out beginners and aspiring crossword champions by giving us three crossword solving tips that will get them headed in the right direction? The New York Times is the "gold standard," but if you're not ready to spend $40 a year for access to those puzzles, most of the publishers I mentioned above make their crosswords available free on the internet. You can see Puzzle Pointers for links. For instance, Merl Reagle's style is accessible and his themes are clever and funny. Newsday (Creators Syndicate), edited by Stanley Newman, has an easy and mostly trickery-free puzzle that's good for beginners (but watch out for the very difficult Saturday Stumper!). And CrosSynergy syndicates an easy-medium puzzle by a rotating roster of top constructors. There's also a whole world of puzzle books and magazines to explore. Look for crosswords that suit your taste and skill level. Don't worry, that doesn't mean using flash cards, unless you're into that sort of thing. When you come across an unfamiliar answer word, or don't understand how it fits the clue, ask the internet for assistance. The blogs are usually good at explaining the difficult parts of the daily crosswords, but if you're stumped on an older puzzle, a simple Google or Wikipedia search should help. And don't be ashamed about Googling to help you finish a puzzle — as Will Shortz likes to say, quoting former editor Will Weng, "It's your puzzle. Solve it any way you want." If you've mastered early-week crosswords, but can't seem to make any headway on a Thursday, keep at it. It took me many months of obsessive solving before I could consistently finish the tough Saturday puzzles. If you find the Monday puzzles too easy, try using only the Down clues, or time yourself and see how fast you can solve it. And if you think a constructor has used too many abbreviations and obscure words, see if you can come up with better fill for a corner or a whole puzzle — you might enjoy the challenge of constructing. Just make sure you're having fun — that's what crosswords are for!